The Blues Brothers are on a mission from God. Are you? 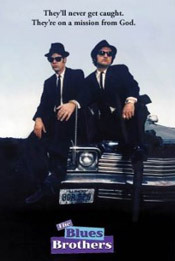 Amid the hundreds of news items emanating from Rome last month was this little gem: The Vatican newspaper L’Osservatore Romano officially designated the film “The Blues Brothers” as a “Catholic classic” and recommended it for viewing by Catholics everywhere. Now I’m all for the Vatican commenting on popular culture and helping us discern inspirational messages from our films, music and books. That’s the same goal as this column. But to recommend a 30-year-old, R-rated film with lots of cursing, weapons firing and mass destruction of Chicago police cars for spiritual inspiration? Well, the Vatican’s designation certainly made me curious and warranted another viewing of the film on DVD. Besides, the music is fantastic! My notes below include the appropriate time stamps of the action. Lights, camera, action! 2:54 At the Joliet (IL) Correctional Center, inmate Jake Blues takes his last long walk across the courtyard. After serving three years of a five-year sentence for armed robbery, he is being released for time served and good behavior. 6:36 Elwood Blues picks up his brother outside the prison in a black and white car he bought at auction. The old police car, still labeled with the phrase “To Serve and Protect,” has a cop engine, cop tires, cop suspension and cop shocks. It’s the new Blues Mobile. 15:55 Standing in the back of the church listening to the preacher (James Brown) and the invigorating music, Jake experiences a spiritual conversion. He sees the light and realizes that they must put the band back together to earn the money needed to save the orphanage. 37:33 They begin their search for former band members. They find most playing to sparse crowds at the Holiday Inn as Murph and the Magic Tones. 41:50 Band members doubt they can get the band back together. “Well, me and the Lord have an understanding,” says Jake. “We’re on a mission from God,” says Elwood. 47:04 They convince Mr. Fabulous to leave his maitre d’ position at the Chez Paul restaurant and rejoin the band. 51:32 They order four fried chickens, a Coke and dry white toast at the Soul Food Café. Despite his wife’s objections, they convince Matt “Guitar” Murphy and Blue Lou to leave the Soul Food Café and play again. “You better think about the consequences of your actions,” says Mrs. Murphy (Aretha Franklin). 1:06:41 They play their first gig at Bob’s Country Bunker, masquerading as the Good Ol’ Boys. They skip out on their bar tab and are chased by Bob and the real Good Ol’ Boys. 1:20:26 Still broke, they blackmail their old agent (Steve Lawrence) for a gig at the Palace Ballroom. 1:37:16 Finally on stage in a packed house, Jake and Elwood’s talents shine through. “Everybody needs somebody to love,” they sing. 1:43:10 “Where did the Blues Brothers go?” ask the police in attendance. 1:46: 48 With $5,000 bucks in hand, Elwood says “It’s 106 miles to Chicago, we’ve got a full tank of gas, half a pack of cigarettes, it’s dark and we’re wearing sunglasses.” “Hit it,” says Jake. 1:47:18 While the Blues brothers race to deliver the money to the Tax Assessor’s office, they are chased by the Illinois State Police; the Good Ol’ Boys in their Winnebago; the Illinois Nazis; Chicago City Police in squad cars, boats and on horseback; the SWAT team; the Illinois National Guard in jeeps, trucks, tanks and helicopters, while rappellers and sharpshooters take up positions on the building. 2:03:59 They successfully pay the tax bill, save the orphanage and get a receipt from the clerk (Steven Spielberg). No, crime does not pay. But hard work, your God-given talents and the motivation to help others will get you far. Just ask Jake and Elwood, if you can catch them. First published in the July 9, 2010 issue of The Tennessee Register.